Schyler Lindekugel-Sullivan, LCSW, LMHP, RYT200 will be offering Yoga classes and workshops beginning in April 2019 and Olya Mokina, CIYT is offering an Introduction to Iyengar Yoga workshop and a restorative Neck & Shoulder Yoga workshop, both in May 2019. Keep an eye here and on the Into Balance Facebook Page for announcements. 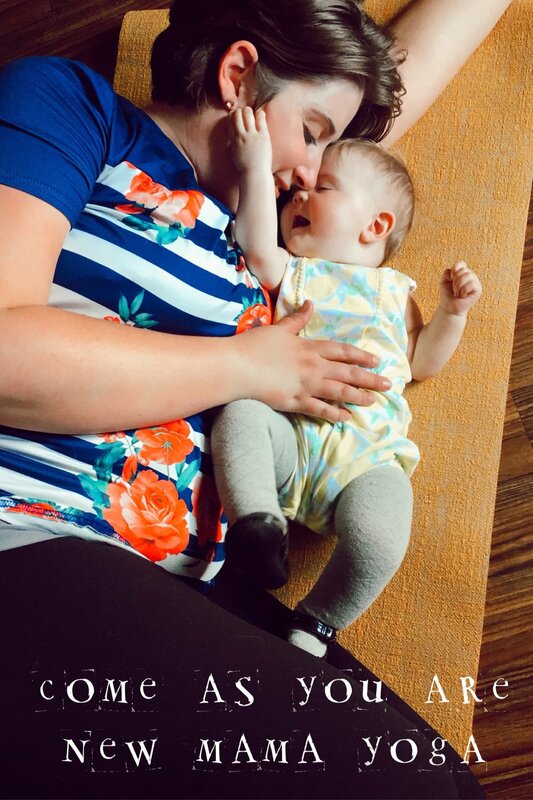 Join Schyler and Luna for a six-week yoga series for new moms. Babies are welcome, but not required for moms to attend. Classes are suggested for moms who are at least 6 weeks postpartum. The classes will be centered on returning the focus to our bodies and breath after pregnancy and finding ways to connect with our babies on the mat. Please come as you are, and know that you do not need fancy yoga pants or a yoga mat to join this class (however, if fancy yoga pants and mats are your thing, you do you mama, and know that everyone is welcome)! This will be a free-flowing class offering time and space for new moms and babes.Nurse and change your baby whenever needed, and feel free to move or not move your body in whatever ways you are called to. We look forward to seeing you soon! This 6 class workshop is $65.00, paid at the time of registration via the Into Balance Website. This 4 class series provides a safe and structured introduction to Iyengar Yoga. The poses are introduced progressively to facilitate quick learning and modifications are included, making the practice appropriate for students of all abilities. Learn about body alignment, how to improve functional movement, and practice awareness of the body in motion. This 4 class workshop is $48, paid at the time of registration via the Into Balance Website. In this specialized 2 hour workshop, you’ll learn specific Iyengar Yoga poses that you can practice at home to improve your posture and increase mobility and strength in the neck and shoulders. This workshop is appropriate for students of all abilities and levels of experience. This 2 hour class is $20, paid at the time of registration via the Into Balance Website. Due to limited space, pre-registration is required for all Into Balance yoga classes. If this will be your first yoga class at Into Balance, a Yoga Waiver and Release form must also be completed prior to class participation. Both of these forms can be found below. Thanks much and we hope to see you in class soon. I understand that I will not be able to participate in this or any other Yoga class at Into Balance if I have not completed and signed the Yoga Waiver & Release Form. Thanks for registering. We’re looking forward to seeing you soon. I agree that, if I experience any pain or discomfort, I will listen to my body, discontinue the activity, and ask for support from the instructor. I acknowledge that, by participating in Yoga classes at Into Balance, I assume full responsibility for any and all damages or injuries that may occur as a result of my participation. I acknowledge that Yoga is not a substitute for medical attention, examination, diagnosis, or treatment and I understand that Yoga is not safe or recommended for people with certain medical conditions. I affirm that I am in good health and that I have not been instructed by a health professional to avoid Yoga or activities similar to Yoga. If I am pregnant or become pregnant, if I am post-natal or post-surgical, I affirm that I have my health care professional's approval to participate in Yoga activities. I affirm that I alone am responsible for choosing whether or not to practice Yoga and I acknowledge that I do so at my own risk. I hereby agree to irrevocably release and waive any claims, present or future, against Into Balance, LLC, it's managers, employees, instructors, and contractors. You may request a paper waiver and release form if you prefer this to the electronic form and electronic signature. Minors may not fill out this form. It may only be completed by an adult participant (19 or older), or in the case of a participant under age 19, by the legal guardian of the participant.